This guide explains how to connect a SmartMatrix RGB LED DMD to a pinball machine running MPF. A SmartMatrix is a cheap ($20) board that you attach to a Teensy ($25) microcontroller which lets you connect an RGB DMD matrix display to the computer running MPF. It’s a standalone solution which you can use to add an RGB DMD to a pinball machine that’s using FAST Pinball, P-ROC/P3-ROC, or OPP controller hardware. MPF supports several different types of RGB DMDs, and the SmartMatrix is just one of the options. More information about this type of display and other options that MPF supports is available in the Using an RGB full-color LED DMD documentation. This solution is very much a “home brew” solution that will require you to buy a lot of parts from various sources. Alternatively, FAST pinball also offers a RGB DMD which contains controller, panels and mounting brackets (ask them directly since it is not currently listed on their website). If you go with this solution skip steps 1 to 3. 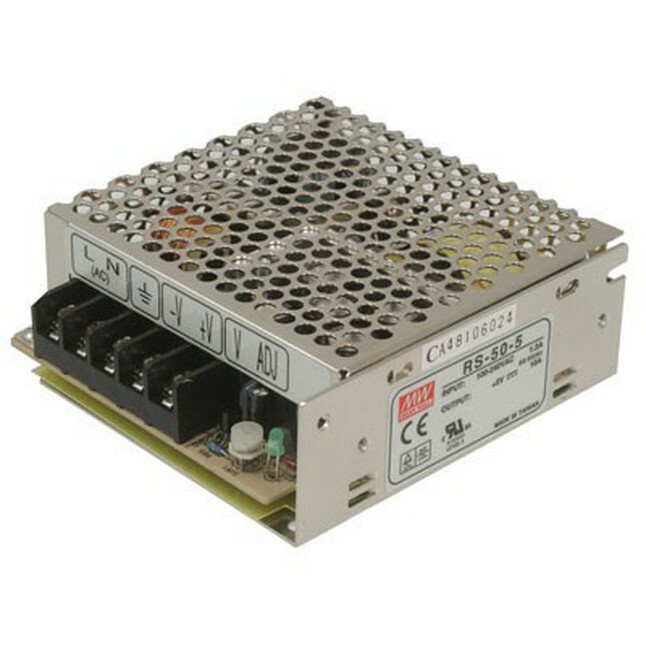 You still need a power supply (step 4). We originally had to buy the panels directly from China via AliExpress, but now FAST Pinball sells a kit. The FAST Pinball option is nice because the price is great and they also include a mounting bracket that fits a standard DMD cutout (ask them directly since it is not currently listed on their website). If you buy the panels yourself on AliExpress, you’ll pay about the same price for just the panels, you won’t have a mounting bracket, and you’ll have to deal with customer support from China. Also FAST tests the panels to make sure all the pixels work—a problem people were running into when buying from AliExpress. Once you have your panel, you need a way to talk to them via a computer. The panels use some kind of 16-pin signalling system which is some kind of standard in the gigantic advertising display industry. The solution for MPF is to use a Teensy 3.2 or 3.5 (which is kind of like an Arduino). The Teensy is available from multiple sources for about $20. Here’s the link to the website of the guy who actually built it, and you can also get it from Adafruit which is nice because you also need the shield (from the next step) which is also available from them. The Teensy runs the same software sketches as Arduinos, though it has a slightly different processor architecture which is needed for the rapid bit-shifting of data needed to control these panels. The software to run the Teensy is open source (more on that in Step 3) and the Teensy has a USB port which you connect to your computer which MPF uses to send the display data to the panels. Next you need a way for the Teensy to connect to the displays. That can be done with the SmartMatrix shield (V4 of the shield is $20 at Adafruit). 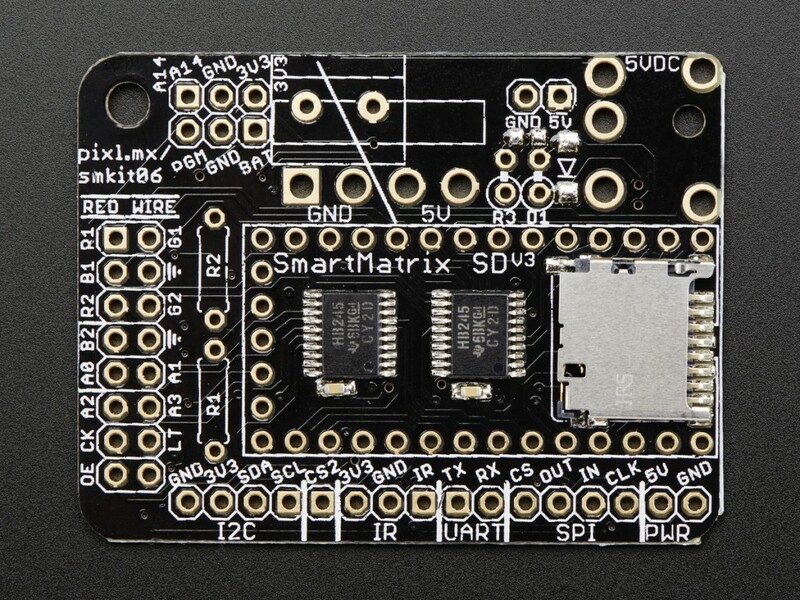 The SmartMatrix shield is a “dumb” device that basically just connects the Teensy’s GPIO pins to the 16-pin ribbon cable that drives the displays. The Teensy mounts onto the SmartMatrix shield, creating a single unit which accepts data via USB on one end and spits out the 16-pin signal for the display panels on the other. These RGB LED displays require 5vdc for power. At first you might think, “Cool! I have 5v elsewhere in my machine, so I’ll just tap into that!” Not so fast. These displays require a lot of power. After all, each pixel is actually three separate LEDs (one each for red, green, and blue), and a 128x32 display means that you have 4,096 pixels. So that’s 12,228 LEDs you need to power! If you’re ordering your RGB LED display panels from FAST Pinball, you can also order a 5v, 10A power supply from them for $19. An ATX computer power supply will probably have a decent amount of amps also, so that could be an option too, just check the specs. Any other 5V supply with decent power should also work. So even though you can do the math and read that if every pixel is on, full white, 100%, that might take more power than you have, there is no way you’re going to run these things at full brightness. Even at 50% brightness, (which would draw only 50% power) most people find these panels to be too bright. One user runs his at 25%, another at 18%. So it’s possible that you might be fine with 5-7 amps of power. You’ll need to connect the power supply up to both panels (the 128x32 display is made up of two 64x32 panels), and while you’re at it you can also use it to power your Teensy. There’s a trace you have to cut on the Teensy to control whether it’s powered externally or by USB. Don’t hook it up to external power if you haven’t cut that trace! 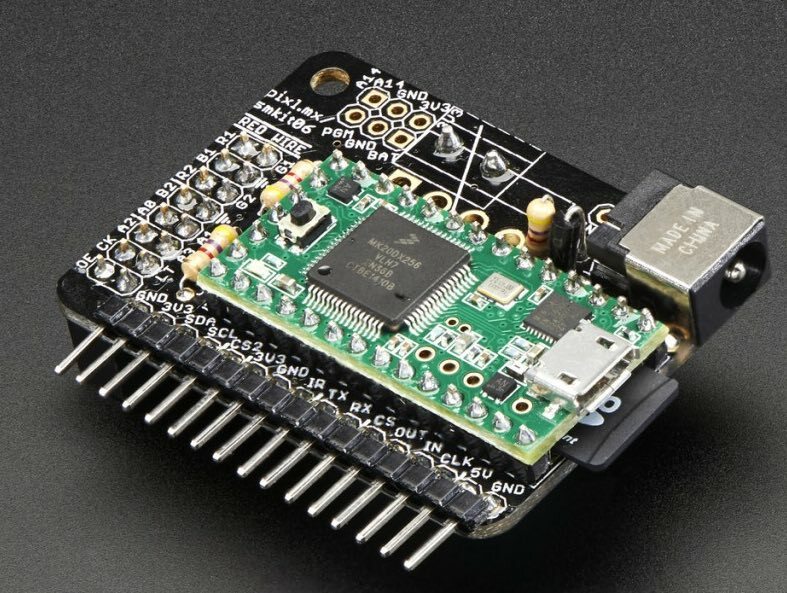 Once your hardware’s built, you need to load the code onto the Teensy which receives the display data via USB and converts and sends it to the pins connected to the SmartMatrix controller. The people who make the SmartMatrix controller have code sample code available. We just took their sample code, removed all the clutter we don’t need, and made it available in the tools folder in the MPF download package. (Here’s a direct link to the code which you can use since you probably installed MPF via pip and don’t have the download package available. Also, here’s the original sample code we based our code on. The V4 shield’s library uses more RAM which can causes the Teensy 3.2 to crash during animations or video playback. Using a Teensy 3.5 or 3.6 solves this issue as they have more RAM. Note that the width and height of your display is set in lines 11 & 12. You can change that if you want to use a different size display. Mark Sunnucks was able to run a 128x64 display by setting the height there and also by changing the DMAs from 4 to 2 in line 14. Here’s a quick overview of how to install this code onto the Teensy. Full instructions are here. Once you have your hardware all set, you need to add a smartmatrix: section to your machine-wide config and which tells MPF how to talk to RGB DMDs that use the SmartMatrix platform. The main thing you have to figure out is the port that the Teensy uses. On Windows, you can just open Device Manager and see which port appears when you plug in the Teensy. The port will be the one that has “usbmodem” in the name on Mac. On Linux it will probably be ttyUSBx or ttyACMx. (The actual number will likely be different on your system.) You can run this command with the Teensy unplugged, then plug it in, then run the command again, and see which port appears. Just enter the baud: and old_cookie: settings like they are in the example above. These are the settings that are needed for the SmartMatrix. If you are using the FAST DMD board set baud to 3000000 . 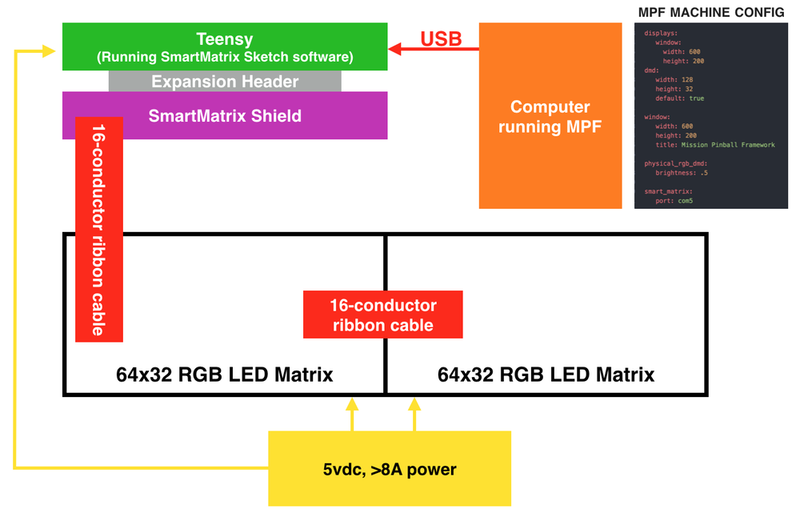 Once you have your SmartMatrix hardware platform set, you need to create the actual device entry for the RGB DMD and map it back to the SmartMatrix platform. You do this in the rgb_dmds: section of the machine config. This section is like the other common sections (switches, coils, etc.) where you enter the name(s) of your device(s), and then under each one, you enter its settings. If you set the brightness multiplier in the sketch code .INO file you loaded onto the Teensy, then that will multiply the brightness after MPF sends it. In other words, if you set .5 in the config file and .5 in the sketch, then the final brightness will be 25%. You might want to set the absolute max brightness in the .INO file once and then fine-tune it via the config file later. Now that you have everything configured, the last step is to make sure the DMD knows what content to show. In MPF, you do this by mapping a physical DMD to an MPF display. At this point you’re all set, and whatever slides and widgets are shown on the DMD’s source display in MPF-MC should be shown on the physical RGB DMD. Be sure to change the smartmatrix:port: setting in this example config to match whatever port your Teensy is connected to. To run this sample config, you can either run mpf both. When you run it, do not use the -x or -X options, because either of those will tell MPF to not use physical hardware which means it won’t try to connect to the Teensy. Note that the Using an RGB full-color LED DMD guide has more details on the window and slide settings used in this machine config.